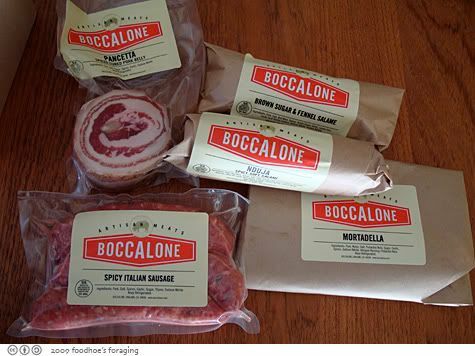 After chasing down the Boccalone Salumi cycle and sampling their delicious products, I immediately signed up to be a member of the illustrious Boccalone Salumi Society. Here is the card that is issued to members. I feel so special and like to flash the card at the store so that I have priority access… I jest, really I do! There really is a cured meat club CSA, which presents a fine way for me to support a local producer and satisfy my cravings for tasty salted pig parts. 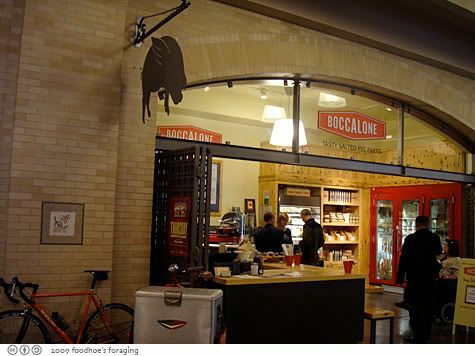 Being a local member, I get to hand pick my Sacchetto (Italian for box) at the Salumeria in the ferry building which is then packed up in a happy meal style box. This is the preferred method because then you can get samples of the various products first. 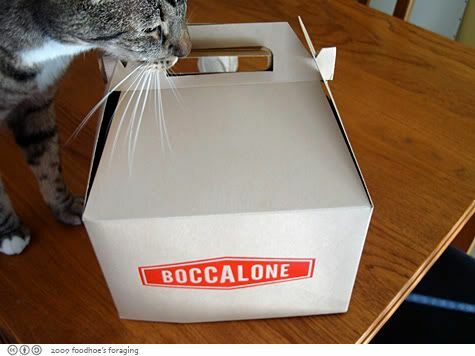 My cat found the aromas to be irresistable. The salumeria is like a candy store. The selection is dazzling, I was mesmerized by the rows of salami chandeliers and large hunks of aging meats hanging in the refrigerated case. The small store can get quite busy, but I found the customer service to be as excellent as the selections. They even helped me find stuff from the top shelf, which I could barely even see on tip toe. 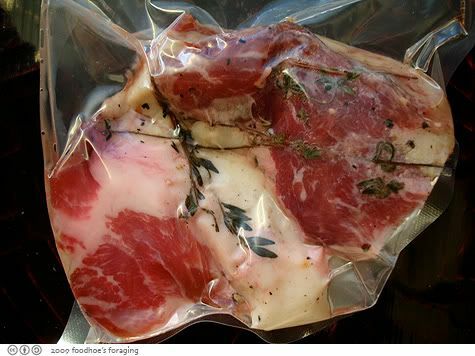 Look at this beautiful guanciale, I love that there is thyme inside of the packaging, it looks so artisinal. I grew up on Oscar Mayer products (who doesn’t know the song… my baloney has a first name, it’s o-s-c-a-r…?) and used to love their pink porky products. Did you know they are on facebook and that you can follow the wienermobile on twitter? I digress, but I’m telling you, the mortadella here is what bologna is supposed to taste like. Mortadella is the pride of the city of Bologna and is what our pale bland American version of bologna aspires to be. It has a gorgeous firm bite to it, but with a rich fatty velvety texture and is infused with fragrant spices like mace and garlic. It’s supposed to be served very thinly sliced which allows the palate to absorb the subtle flavors of the meat and spices. Coincidentally I noticed that We are Never Full posted a recipe for Mortadella Foam today. Here is the world famous Salumi Cone ($3.25) which has slices of that gorgeous mortadella along with capocolla and something else I don’t remember. Very rich and at last… food in a cone that doesn’t drip! And of course, I had to try the famous Nduja, prounounced en-DOO-ya, which is a soft, spicy hot, spreadable salami that is considered to be one of the most famous of Calabrian foods. 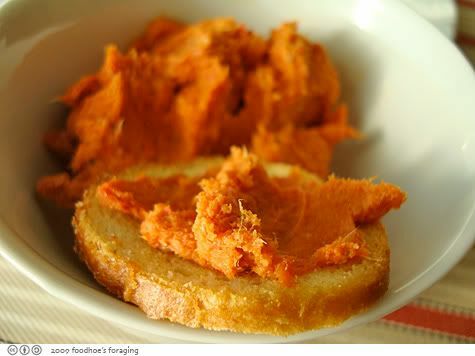 The name nduja comes from the french word andouille, which means sausage. I loved the spicy smoky aged meaty flavor, it fairly bursts with the flavor of a fine, spicy salami. 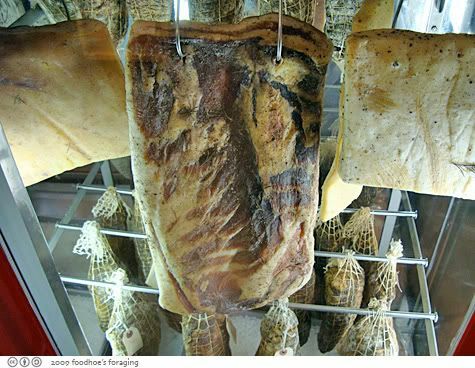 But since I so love the firm chewiness of sliced dry salame I felt a gap in my existence, something was missing. Nope, I definitely prefer snacking on sliced salame, but this would be a fine spread on a sandwich, or used in other ways to add the delectably spicy essence of salame – like on pizza…. I loved the Pancetta, which comes as a hefty chunk that sliced easily into thin fatty curls that I used in a delicious sauce. Fantastic recipes on the site too for some traditional Italian dishes. 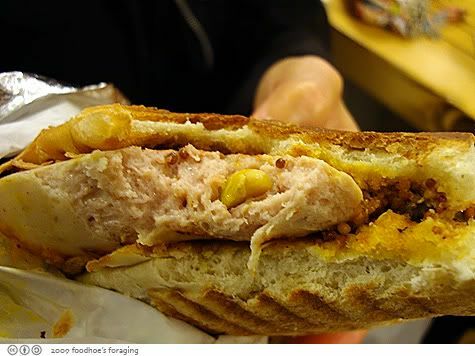 Besides selling cured meats, they also have a delicious menu of panini. The best thing though, is the Mortadella Dog, which is available through the summer. Holy moly, this is one delicious hot dog. But it’s the whole package that makes it taste so good. It is grilled open faced on a panini press and includes the most delicious mustard and pickles. 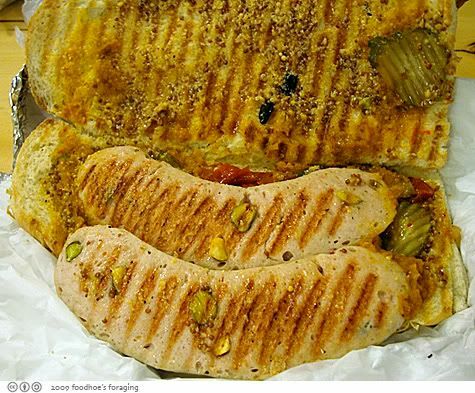 I love it when hot dogs are sliced in half lengthwise and grilled like that. This is really fancy for a hotdog and so delicious, I highly recommend it. I’m hooked on this stuff and am really enjoying this renaissance in salumi artistry. 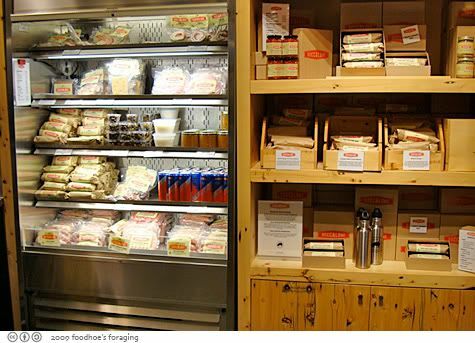 I especially appreciate the fact that the products are made from sustainably raised pigs that have been hand-butchered in small batches and cold-cured with spices from Le Sanctuaire. And lastly, here is a fun video that profiles the society, the founder Chef Cosentino and includes shots of the sausage plant in Oakland. I’m drooling… What a fabulous place! .-= gaga´s last blog ..Argentina =-. .-= grace´s last blog ..herwig’s =-. i think it was Groucho Marx who once said that he wouldn’t join any club that would have him as a member. Well, this is one club I am certainly ready to join! What a fabulous display of porky goodness! I’m especially fascinated with the nduja. It’s not something I’ve tried although it looks not unlike Mallorcan Sobrasada, which is another spreadable salami, but I’m off right now to Di Bruno brothers here in NYC to get me some! Thanks also for the link. Very kind. 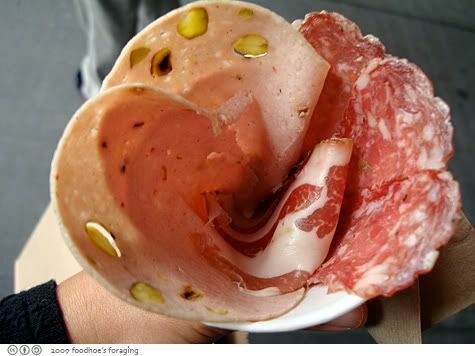 .-= Jonny´s last blog ..Spuma di Mortadella: Let’s Hear it for Preserved Meat Foam! =-. OMG. Where to start? Firstly, congrats on your membership. You must be so proud. I’d flash it all over town too! And your first box of goodness looks and sounds insanely delicious. I’ll be heading up to SF for the foodbuzz fest in November. Can’t wait to check this place out!! Keep eating well, soldier. .-= Gastronomer´s last blog ..Nem Nướng Ninh Hòa – Rosemead =-. Wowzers this place looks amazing. Love the pic of your cat! I also loved all your descriptions – it really does sound like a special club. Meat lovers only allowed. 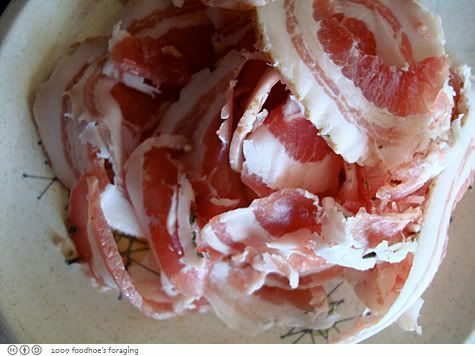 That pancetta looks stunning – it all looks stunning really! Mortadella Dog? Oh my gawd, I didn’t even know they made that. I have a weakness for their lardo. Yes, I know, it’s a slab of cured pork fat. But what lovely fat it is. Sliced paper thin atop crispy, warm bread, it’s the best thing in the world. .-= Carolyn Jung´s last blog ..Cooking with Chef Guillaume at Marché in Menlo Park =-. rosa, yes it is so droolworthy! jonny, how could I not? I mean really… mortadella foam! gastronomer, we do the best we can… yes you should visit and I hope our paths cross when you come up! carolyn, that mortadella dog was the bees knees… thanks for the tip about the lardo, that will be on my list for next time! That hot dog panini looks SO good! I’ve only been to this place once after Giada raved about it. I totally need to go back! .-= Cookie´s last blog ..Rice A Roni to the Rescue! =-. 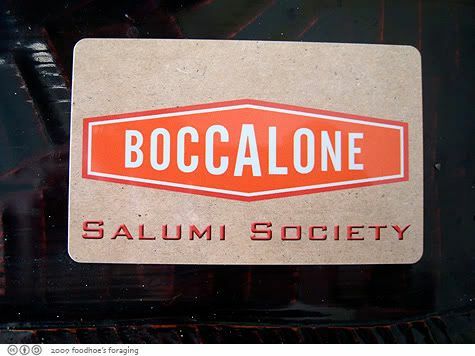 A Salumi Society! What a great idea. .-= Kirk´s last blog ..Rudford’s Restaurant =-. That hot dog looks and sounds amazing. Why is it only offered in the summer? So as a member, how often do you get to pick up a box? Is it monthly? I would join if I didn’t have to worry about my cholesterol. .-= The Single Guy´s last blog ..Travel Mini Dish: Good Stuff Eatery =-. You just gave me the perfect idea for Christmas gifts! I didn’t know they had a mortadello dog, it’s will be eaten on the next visit. .-= cocochanelella´s last blog ..Free lunch Promotion at Poleng Lounge =-.